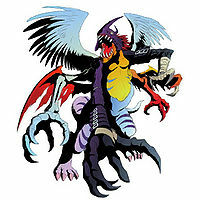 A Composite Digimon for which each part that composes its whole, such as its arms, legs, body, and tail, was put together by synthesizing various Digimon. How this kind of synthesis was performed is shrouded in mystery. 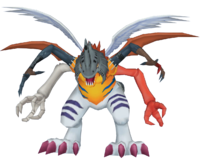 In contrast to Mugendramon, who was synthesized from the metal parts of several varieties of Digimon, it was combined from organic parts, and whether it is Mugendramon's prototype, or it was built to use against Mugendramon, is still uncertain. However, the one thing that is known is that, because of Chimairamon's terrifying combat instinct, it is nothing but a powerful force for destruction. The deadly heat ray it emanates from its four arms is "Heat Viper". Getting hit by this heat ray is like Chimairamon's curse, a terrifying technique which is cruelly dispersed in every direction. 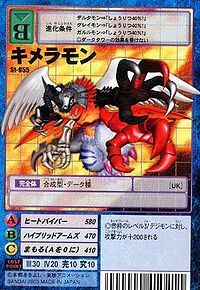 — Digimon Adventure 02: "Chimairamon, the Combined Beast"
Title: 「合成魔獣」 — "Synthetic Evil Beast"
The Chimaira (Χίμαιρα), latinized as Chimera 「キメラ Kimera」 is a monster from Greek mythology that was part-lion, part-goat, and part-snake. Kimera is a romanization of 「キメラ」. Anime/Manga Digimon Adventure 02: "Follow the Kaiser's Base!" This is similar to how the mythical Greek Chimaira is a hybrid monster comprised of the body parts of other animals. 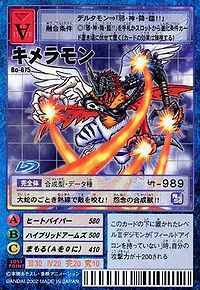 Heat Viper  ヒートバイパー Hīto Baipā Heat Viper/Poison Wing/Sizzling Viper Shoots heat rays from its mouth or four hands. Even if an opponent tried to dodge this, the shock-waves of this attack would knock them to the side. Attacks with its four arms. 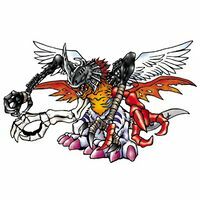 The Digimon Kaiser used data of many Digimon (The torso of Greymon; the head of Kabuterimon; the hair of Metal Greymon; the legs of Garurumon; the wings of Angemon and Airdramon; the tail of Monochromon; and the arms of Kuwagamon, Skull Greymon and Devimon) to create Chimairamon to be his servant and obliterate the Chosen Children. He eventually lost control of Chimairamon but refused to admit it. The only thing that saved both Ken and the Chosen Children from it was Magnamon, with some aid from Wormmon, obliterated him with Extreme Jihad. 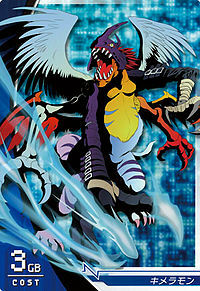 A Chimairamon is one of the Digimon hunted by Tobari Ren. 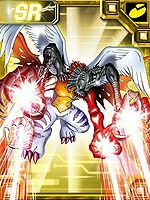 A dying Chimairamon and a Mugendramon are mentioned to have Jogressed to create Millenniumon. It is the pre-final boss Digimon of Anode Tamer's main storyline before it fuses again into Millenniummon. When it is accompanied by Millenniummon in the battle, they can learn Apocalymon's Ankoku, which is the strongest of all damaging Variable Techniques. Chimairamon can evolve from Dark Tyranomon or Greymon in the first version, Unimon or Bakemon in Wind Version, Rukamon or Whamon in Cool Version, or Cyclomon or Leomon in Nature Version. It can evolve into Raremon (any Version), Mugendramon (first version), Seraphimon (Wind Version), Plesiomon (Cool Version), or Rosemon (Nature Version). Chimairamon is an unavailable Digimon normally in the game, but can be obtained by transferring a Chimairamon from Pocket Digimon World by using save file on Memory Card. Unlike on Pocket Digimon World, it is treated as Ultimate level instead of Perfect level. It does not evolve from any Digimon. 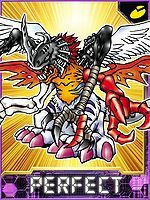 Chimairamon is a wild Digimon that can be found on Asuka Dark Dungeon, and is also used by A.o.A's Qing Long Chief and the real Qing Long Leader. Its attack may able to put Digimon into sleep. Chimairamon is also available as a Perfect Red card with 29 AP / 27 HP. 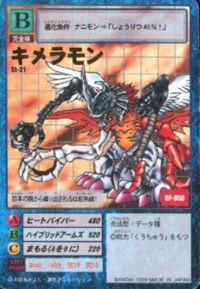 Three or more Chimairamon cards on the field will create Mugendramon combo. Chimairamon appears as a boss Digimon at Junk Factory. However, it cannot be obtained or evolve from any Digimon. 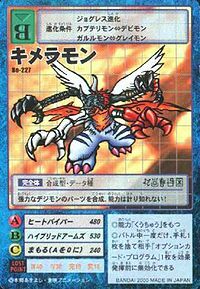 Chimairamon can be evolved from Devidramon if above Level 44, Dark EXP 11000, and already befriended Chimairamon. It can evolve to Moon Millenniumon if above Level 66, Spirit 370, and already befriended Moon Millenniumon. Chimairamon is available as a Digimon Medal. 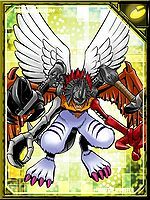 Chimairamon is available as a Digimon Card. Chimairamon is available as a Digimon Medal. It also has an unused model in the game files. Chimairamon evolves from Blade Kuwagamon or Coelamon. It can evolve to Bantyo Liomon or Metal Etemon. 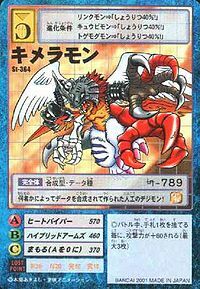 It can also Jogress with Metallife Kuwagamon to evolve into Tyrant Kabuterimon. It shoots a super heated beam from its four arms! This synthetic Digimon was made by someone fusing data together! It bites the enemy with a giant snake-like heat ray! The composite beast of hatred!! 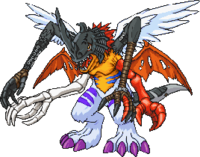 A Digimon formed from the fusion of organic parts from various Digimon. It moves solely by its combat instinct, and aside from its sky-high battle capabilities, everything from its origins to its behavioral principles is unknown. 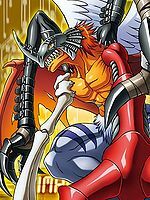 ↑ 7.0 7.1 7.2 7.3 7.4 7.5 Digimon Xros Wars: "Xros Revolution!! The Guide to Miracles!!" This page was last modified on 10 April 2019, at 18:58.